30" Black nylon bunting suitable for draping police stations, firehouse bay doors, building signs, firetrucks, etc. Sides are hemmed. Sold by the yard. For an approximate 12 wide bay door purchase 8 yards per bay. The above lengths allow for a swagged horizontal piece dropping down on both sides an appropriate amount. The 4 yard and 8 yard lengths are normally stocked and ready to ship. 3' x 6' Mourning Fan - 5 stripe - Purple & Black or All Black. Canvas band across the top with grommets for easy hanging. Designed to slide over your badge during your time of mourning. Easy to use. 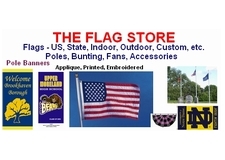 See the offering of large US flags suitable for hanging between two aerial trucks to create an arch for the funeral procession to pass below. Pre cut and sewn Fire Truck 30 inch wide x 12 feet long black bunting. This item is in stock and can ship right away. 12 feet should fit across the front of most fire trucks allowing for across the front of the truck as well as some drop on each side. Pre cut and sewn Fire Station Bay Door 30 inch wide x 24 feet long black bunting. This item is in stock and can ship right away. 24 feet should fit most bay doors allowing for across the top of the bay as well as some drop on each side. Black Bunting cut and sewn to cover your light bar for a funeral procession. These are custom made based on the dimensions of your light bar. These are flat pieces with end extensions to place over your light bar. Grommets are installed for you to use to tie the cover over the light bar. Note: These are custom made and are not stocked for immediate shipment. Email CH835@aol.com or phone 610-584-4996 with specific bar dimensions for a quotation. As a point of reference 72" bar covers are approximately $60.00 each. 24" to 36" bar covers are approx. $35.00. Made of 200 denier nylon. Item is not stocked, but turn around time is usually 3 to 5 days. The length, width and height measurements are necessary for production. Measurement should be to about 1/2" in accuracy. Black/Purple/Black nylon Tri color Mourning bunting. FDfriendly.com has joined a group of manufactures who recognize the traumatic effect a LODD has on a department and family members. These manufactures offer a rapid response to your needs in acquiring items necessary for a LODD funeral. Take a look at the site for more information. White nylon - one size fits most - uniform gloves. Sold as a pair.